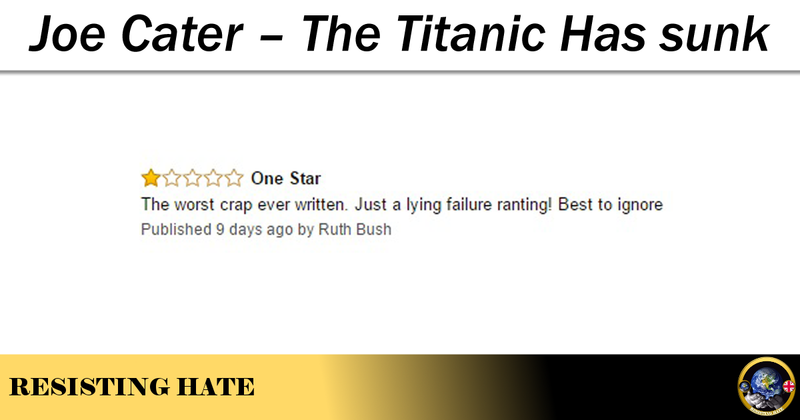 Joe Cater is the author of the not so well selling, self published pdf on Amazon called Titanic Britain – Left Wing Liberal iceberg. Up until 2 days ago he also had a Twitter account with a large following but this has now been suspended (as have the three attempts he has made to reincarnate his Twitter presence.) His latest attempt to circumvent the ban has been to pose as his own fan (@raise_titanic) which has caused much hilarity among our group members although, to be fair to Cater, his new Twitter account has already managed to attract more followers than the 34 who have liked his Facebook page. 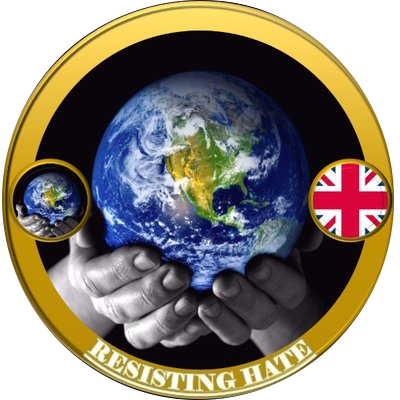 It is no secret that Resisting Hate object to authors who seek to demonise those with politically left leanings and, worse, those who would oppress and denigrate communities based on their culture and/faith. 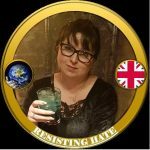 Cater is yet another example of an individual jumping on the band wagon of hate and trying to establish a reputation and make money at the expense of spreading lies and misinformation about the current climate in Britain. On the contrary Margaret it is people like yourself who are a danger to our society. We stand for equality and equal values for all human beings. What do you stand for? Division? Hate? Misplaced Nationalism? And what part of being a Christian do your views reflect? This book is a dreadful read. Full of hate, misinformed opinions and pure prejudice. No wonder it’s self published. I think he’s typical of the little Texas Yorkshire man. 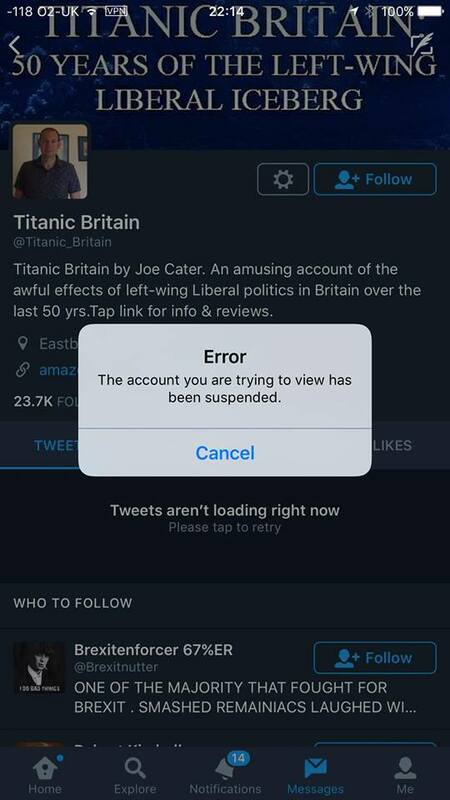 His replacement account, Titanic_Joe, is also suspended. Poor old Joe. He struggles to keep accounts on Twitter. Dear God, the left wing thought police have come to life! Resist at all cost and read anything you want, left or right wing, only this way can we remain free. 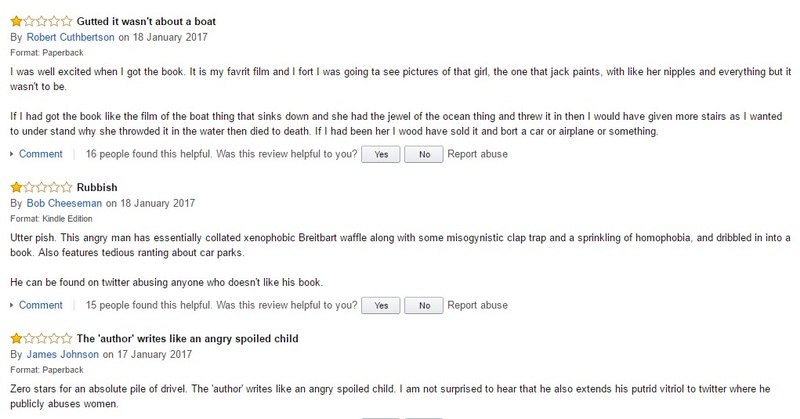 You may be surprised to find that a great deal of what Joe Cater writes is actually a slightly over egged version of what the silent majority thinks, no amount of phoney book review ratings can deny the 5 stars shown on the Amazon site and the Twitter ban makes his case even stronger. Tread carefully left wingers or you will surely reap what you sow! I don’t know this Cater but had a look at a preview of his book. Looks like tripe. 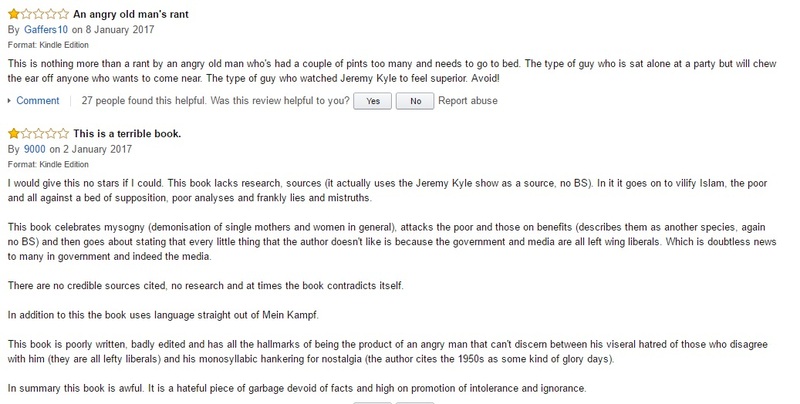 “Appears to have been written by a belching armchair, and proofread by some biscuits.” Best review of the book I read. 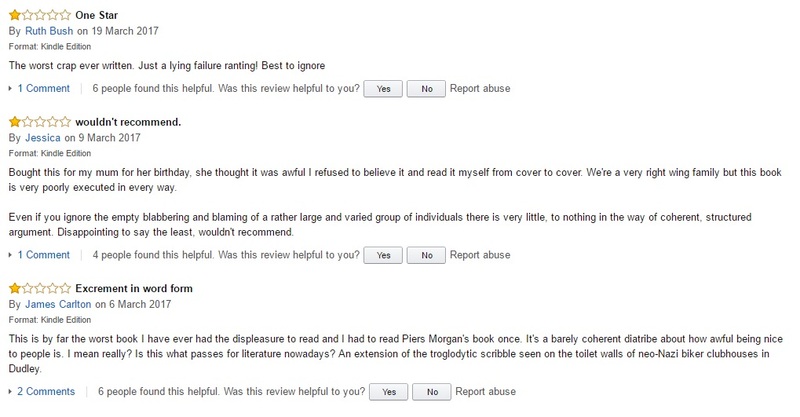 Never mind the 5 star reviews from the right-whingers, always best to go straight for the 1 stars. Usually better than the book itself.